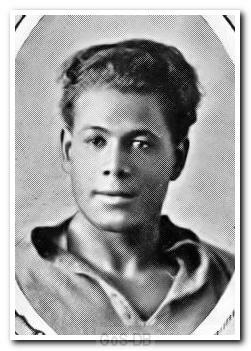 Born of a Jamaican father in Canning Town, Leslie was the only black player in England during his time at Argyle. Signed from Barking Town, he struggled to break into the first team in his first two seasons, but a move to inside-left transformed his career. The arrival of Sammy Black did no harm either, and the two became one of the most feared left flank combinations in the League. A versatile player, he often provided cover at centre-half, or indeed any other position which was required. In 1930, The Herald described him as "known throughout England for his skill and complexion" and rumours abounded that top clubs were keen on a transfer, but a move never materialised. Leslie spent his entire League career with Argyle, appearing over 400 times in all competitions and he remains the Pilgrims' fourth highest goal-scorer of all time. At one time it was reported that he was to be selected for England, but formal confirmation of his call-up was never received. It was rumoured that the selectors had changed their mind because of the colour of his skin. Remarkably nearly 50 years passed before a black player appeared for England, when Viv Anderson made his debut against Czechoslovakia in a friendly at Wembley in December 1978. In 1982, whilst working as a member of the back-room staff at his local club, West Ham United, Leslie said to renowned sports journalist Brian Woolnough, "They must have forgotten I was a coloured boy". Jack Leslie, a true Argyle legend, passed away in 1988.